These guys have done it again. Their last two albums topped my “best of” lists for the years in which they were released. I think this one will probably do the same thing. Each album is different and this time they tackled space rock. Space rock is one of my favorite types of music, and I like this. Rather than just follow the Hawkwind school of sound, they bring a lot of variety and different sounds to the plate. All of it, though, follows a path that tells a story of space travel. The lyrics to this concept album are all about space and the music feels suitably spacey to go with it. 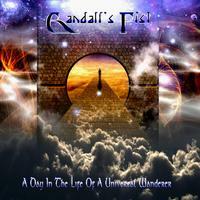 Gandalf’s Fist is one of the best modern progressive rock bands. At least they sure manage to please me time and time again. Atmospheric, dreamy, psychedelic textures open this and serve as the backdrop for the piece. There are spoken words that come over the top of this. That gives way to an electronic chirping sound at the end. There is a dramatic and rather mysterious majestic element as this cut opens. The verse vocals are spoken (more or less) distorted and rather creepy. The vocals on the chorus have a strained element to them that works well. It’s almost like a sung chant. This is a powerful piece of music. It’s theatrical and rather ominous, but also has a magic element to it. That chorus hook is great, too. This has a killer instrumental jam later that is just a little nicely off-kilter. That features some soaring progressive rock guitar soloing. It drops back further down the road to a mellower jam that has some nice saxophone soloing over the top. That movement almost feels a bit like a cross between Genesis and Pink Floyd to me. After it returns to the song proper for a time, they drop it down to a mellower, acoustic guitar driven space rock section. It builds back out to the more full treatment later to take the piece to the end. The opening section is dramatic progressive rock with a crunchy but melodic guitar. They drop it down to a mellower space motif for the vocals. There are some soulful female vocals that come out after the first verse. Eventually were taken out into a more rocking space sound that has more mainstream rock vocals. The guitar solos out after that section. A return to earlier space rock takes this piece out. Piano starts this off and holds it for a time. After the introduction the piano leads it into the song proper with some powerful and evocative female vocals bringing the melody and lyrics. This ballad is pretty and powerful. It’s more than two minutes in before anything other than the voice and piano are heard. Then we get a short instrumental section that intensifies the melodies we’ve heard so far. After that section, though, it drops back to the piano and voice for the rest of the piece. Percussion starts this. Then a hard edged guitar sound that’s almost metal takes it. Still, there’s a bit of a Hawkwind-like space rock vibe here. It drops back for some nicely odd sounds. This has a bit of a King Crimson meets jazz and space element to it. We’re taken into a cool rubbery sort of jam that seems to reflect those various sounds. The vocals come in over the top of this. The cut powers out further (but keeps the same basic straightline intact) on the chorus. Later it turns a bit metallic, but then shifts to spacey sounds for some chirping harmonics. It returns to the more rocking section for more vocals before they end it. A narrator is heard here, moving the tale forward. As he reads the text the music works through several shifts and changes. The percussion is quite prominent here. The music is more pure progressive roc k in this section. Then it powers up after that narration to more of a straightahead rock sound for the singing. More narration returns. This time it’s got some theatrical voices in the backdrop carrying the story forward. Beyond that section a guitar powers out a melodic, but crunchy solo. The main vocal section returns after that. A bit mellower than some of the other music here (at least at first), this is psychedelic space rock with some definite Pink Floyd elements in the mix. After a time this powers out into something that’s rather metallic. In fact, I’m reminded at times of some of the more proggy music from Iron Maiden at times. This has a much harder rocking sound during this movement. As the trippy space rock opens this, the melodies of the vocals are just awesome. This cut carries forward going through some changes. We get some female vocals after the first batch of male singing. There is a more Yes-like instrumental section later and after it settles back down to the song proper we get some saxophone soloing. A mellower song, this is a slower moving one. It has some great melodies and an intriguing texture. It’s dramatic and mysterious and suitably spacey. More of the narration returns near the end. This seems quite related to the previous track. It’s got intricate picked guitar and layers of melody and atmosphere. A violin (real or simulated) weaves a trail across later. Female vocals bring it almost into a folk progressive rock style. The cut continues growing and those vocals bring more drama as they continue. I swear I can hear some melodic ties to Led Zeppelin’s “Stairway to Heaven” on this at times (the powered up part of that song). This really has an old time folk rock vibe to it in a lot of ways. Dramatic and powerful, yet still reasonably mellow music opens this and carries it through the introduction. There are jazz and space elements here in equal amounts. Still, hard rocking sounds are heard later as a crunch guitar leads it. They give way to a return to the melodic, mellow space rock, though. The vocals on this song are female. We get a number of shifts and changes in terms of the music presented here. Around the three minute mark it turns to a rather intricate bit of space rock. Then that eventually drops away and a new stripped down motif brings it back into being. This gets some power infused as they turn it almost metallic later. Some male vocals come into the mix. Then it works back out to the earlier section after that and a return to the female vocals also comes. Another metallic jam (with more male vocals) emerges later. There’s a screaming, but still melodic guitar solo over the top of that after a time. The various sounds all seem to merge later. Both female and male vocals are heard and the jam is incredibly powerful.